Management of a cow at calving is a pivotal part of setting her up to cope with the stresses and demands of lactation. 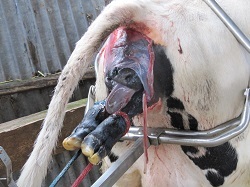 Recognising when to assist a calving cow and the correct technique to use is crucial for preventing both short and long-term health issues of the cow and calf. Similarly, it is important to know when a vet is necessary for a successful outcome to the calving.